Dreams Come True are something of a rarity in the Japanese pop world: a band that have achieved great success on the back of talent alone. Led by the infectious and uplifting vocals of Yoshida Miwa, Doricamu (as they are known to their Japanese fans) built a solid reputation over two decades that was rewarded with the prestige of recording theme tunes for Disney movies (think Elton John or Phil Collins). DCT started in January 1988 in Tokyo when Yoshida teamed up with bassist Nakamura Masato and childhood friend and keyboard player Nishikawa Takahiro. They played live houses around the city for several months before recording their first album in the UK, which was released in March of the next year. The eponymous debut album became a million-seller, as have all 10 original albums since. The 1992 release The Swinging Star sold two milion copies in its first week of release and was for several years the most popular album in Japanese music history with over four million copies sold. In 1993, one of their biggest hits, Winter Song, was the opening theme to the Hollywood movie Sleepless in Seattle. They had a No.1 in 1994 with Wherever You Are with Maurice White of Earth, Wind and Fire. Yoshida also released some singles as one half of a duo with the strange name of Funk the Peanuts. "The band was created to introduce everyone to Yoshida the singer," says Nakamura. Born and raised in Hokkaido, Yoshida developed a love for the rhythmical music she listened to on US Armed Forces Radio, at the time the only real source of Western music in Japan. She remembers, as a child, being mesmerized by legendary jazz singers such as Ella Fitzgerald and Sarah Vaughan. "I want to be able to stand up at the age of seventy or eighty and move people with the sound of my voice," she says. In 1998, the band released an all-English version of their Sing or Die album. Despite the fact that Yoshida's ventures into singing English lyrics have been almost flawless, the band remain virtually unknown outside Asia. But they acheive a rare feat - making Japanese lyrics compatible with western music. So the world may yet learn about this jewel of "beauty and harmony" (the meaning of the kanji for "Miwa"). Nishikawa announced in March 2002 that he was leaving the group to pursue a solo career. He was arrested the following October on assault and drug charges, for which he received a suspended sentence. A second arrest for drug possession in early 2006 led to a prison sentence. Yoshida was hit by tragedy in September 2007 when her common-law husband Sueda Ken died of a brain tumor at the age of 33. 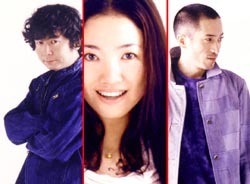 Sueda had directed many of the band's promotional videos. There was happier news in the summer of 2008 when Nakamura married Onaga Maki, the vocalist of popular rock band High and Mighty Color. The media's natural focus was on their age difference - Nakamura was 49 at the time, while Onaga was just 20. They announced in the spring of 2009 that she was expecting their first child.